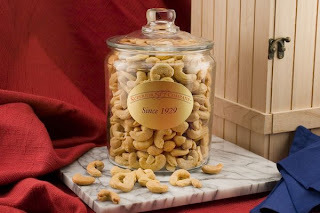 If you love nuts as much as my family, then you are going to love Superior Nut Company! Peanuts, almonds, cashews... nuts are a delicious and healthy snack, that my entire family enjoys! Superior Nut Company offers a wide variety of beautiful Gift Boxes, Gift Towers and Nut Gift Baskets, a delicious treat that's good for every occasion. I love that they have a huge selection, my only issue was being able to make a decision on which item to purchase! I wanted so many items, they all looked so tasty! My husbands favorites are cashews, so when our giant whole cashews arrived, he wasted no time opening them up and grabbing a handful! I'll admit that these giant cashews are the biggest, the freshest and the tastiest I have ever eater. They are oil roasted in small batches and are available in both salted and unsalted. You can choose between a large variety of nuts, fruits, cakes, pies, and so much more. Order a little, or purchase in bulk! Browse their specials for even greater savings. I prefer the items that include free shipping, making my money stretch even further! This giveaway will end December 8th at Midnight EST. Disclaimer: I received a complimentary e-gift card from Superior Nut Company for the purpose of writing a review and hosting a giveaway. Regardless, I only recommend products or services I use personally and/or believe will be a good fit for my readers. The views and opinions expressed on this blog are purely my own. Results may vary. No monetary compensation was received. I would get the collasal pistashio gift for my dad! I would probably choose their Deluxe Special Mixed Nuts. Colossal Pistachios (1 Pound Bag. I like the Deluxe Mixed Nuts Gourmet Tray. I want to try the 6-Section Cashew Assortment Gift Tray! I give the Superior Nut Deluxe Holiday Sampler Bucket to my dad for Christmas! The Ultimate Chocolate Dipped Australian Glazed Apricots because I love Apricots! I might get the Hickory smoked almond tin! I'd get the Whole Cashews. Natural Pineapple, no sugar added 1 lb bag and Dried Peaches no sugar added 1 lb bag. I would pick out a selection of their nut butters, cashew, almond, walnut and brazil nut. I would choose the Chocolate Chip Coffee Cake! I would get some Squirrel Nut Zippers. I'd pick Milk Chocolate Covered Cashews (1 Pound Bag). I would choose the White Chocolate Macadamia Butter. I would choose macadamia nut butter for me and unsalted pumpkin seeds for my bunny! I'd get the banana walnut coffee cake!